I hope you all had a wonderful weekend. We had a laid back kind of weekend...Every weekend I've been working on organizing something in my craft room and making things flow a little better. Saturday I spent a little time working in my room and Sunday after a nice family day with Scott and Ethan I went to the movies with my sister and aunt. Since I didn't really have anything planned for a video today I thought I would share what this weekend's organizing project was. Last weekend when I started working on my layout of Ethan and his cousins I had the worst time trying to find papers. I would pull out collection after collection and ended up with all of them out on the floor, on my desk, just everywhere. So I thought about it during the week on how best I can make that process a little easier. I decided having them bundled like this wasn't working for me. I started taking them out of the packages and using a tip I got from Nichol Magourick I'm going through them and putting the patterns I like the best face out so I can see them. I only got through three companies so far. 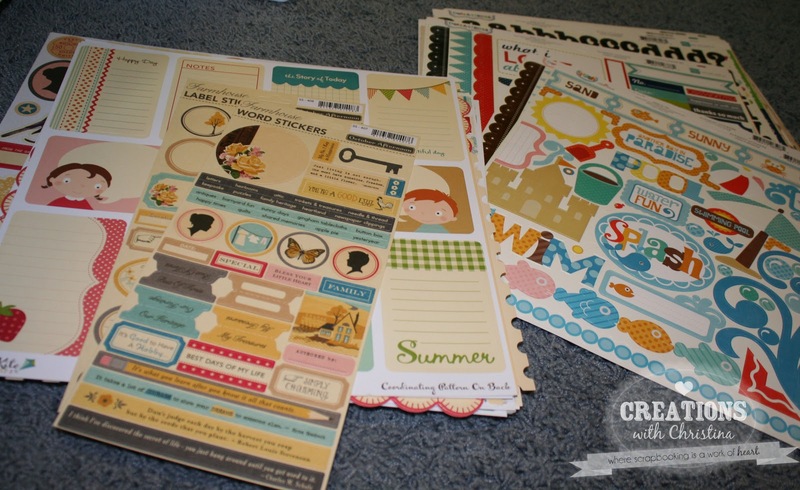 Of course doing this I found all these great sticker sheets, alphabets, and journaling cards. I think next weekend I'll be looking at my embellishments. I'm also going to start doing Project Life. I was talking to Teri and she gave me that little push I needed to start it. I ordered the kit and it came this past week. I know I'm a a couple weeks late starting, but I'm OK with that. I was telling my mom about it and she's going to do it too. I decided daily was way to much for me, so I'm going to do it weekly. Since I missed the first couple weeks I'm going to do a week1-4 page and just document some of the things we did in that time. Then start full this week. 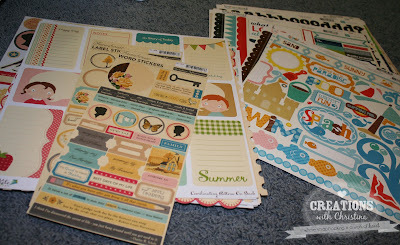 If you're not familiar with Project Life you can find info on it HERE. Project life is really interesting but I am not feeling having to fill up all those little pockets. I can't wait to see how you make out. I am doing the same thing in theory this year but using a smash book instead. Christina, your paper looks so neat and tidy, and I need this!!! What and where did you get the clear plastic paper holders you have yours in? I need those. Cropper Hopper makes them and you can get them at their website or at places like AC Moore or Michaels. Oh, This is a great idea!! I too am starting project life!! 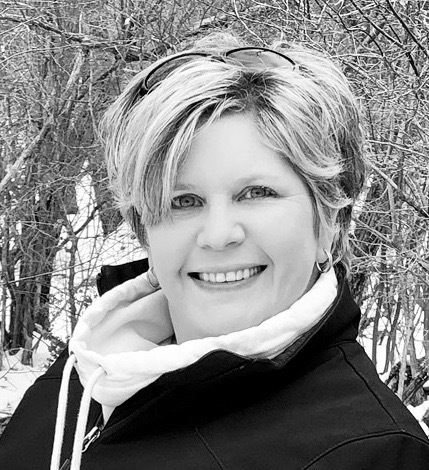 I can't wait to see how your projects come to "life"! I was thinking about doing the same thing. Like you, I have my paper stored by company and then collection. 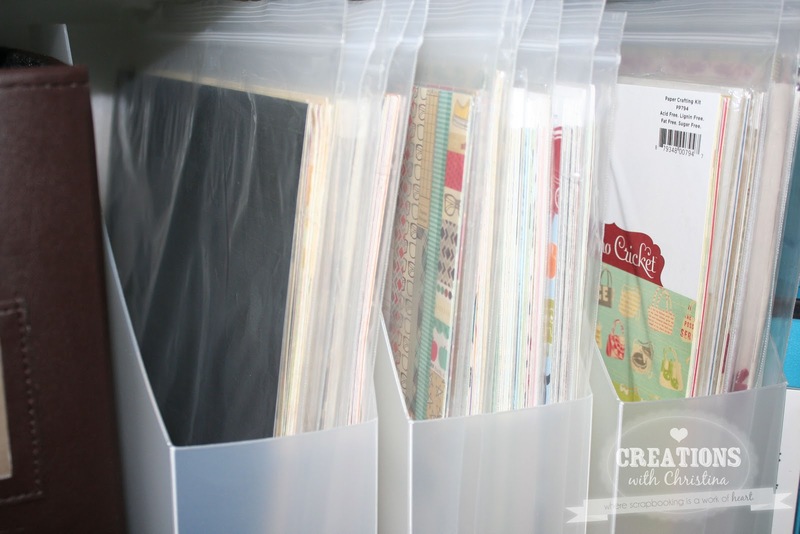 Are you thinking that you will just put all of your sticker sheets together in their own home? I am thinking that I might do that because I love how Nichol is always grabbing her sticker sheets so easily. It would take me forever right now to go through all my sticker sheets to find something that matches!! LOL!! I keep my paper organized in the bags like you did in the first picture. I also keep my scraps in the bags with the paper. What do you do with the scraps? I used to keep my scraps with the collection, I picked up a 12x12 ArtBin storage container from Joann's and will be keeping my pattern scraps in one and my card stock in another. 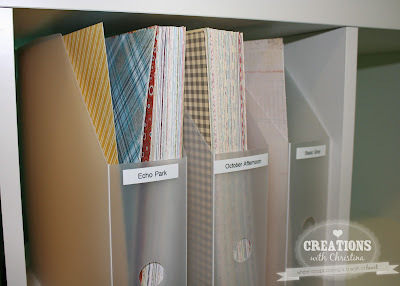 I have also been working on the best way to store my pattern paper. It's still a work in progress. I recently decided that I'm not a big fan paper pads anymore. Way to much of the same stuff and not enough of the sheets I like the most so they are staring at me. I'm glad you're trying P.L. This is my first year and I love it. Can't wait to see your approach. I am so hesitant to take the collections apart so I would love if you did a follow-up to let us know how you are finding this system! Oeganizing paper is keeping me busy right now. I keep hearing about Project Life but I really don't understand it. Could you tell us about it and maybe show how you approach it? Love this idea! Where do you buy your paper and which ones are your favorites? 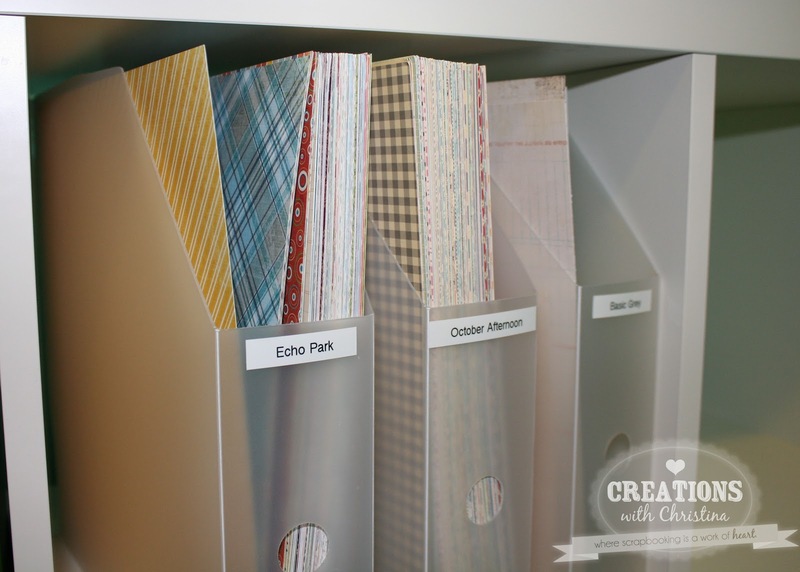 Great idea for storing the paper. Where do you buy zip bag?